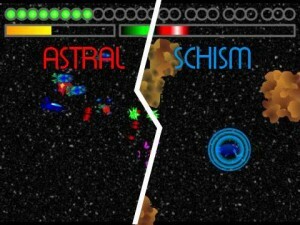 Astral Schism is a game I made as a group project for a class on gender in computer games. The goal of the project was to design and create two variants of a game in order to test gender preferences. We decided to look at the violence/destruction vs. gathering/nurturing split. We created a space shooter with two modes. One mode is a typical space shooter. In the other mode, you gather ore and dodge asteroids. I was responsible for the graphics, music, and final game balance.